One of my favorite beer festivals of the year is coming up this weekend. 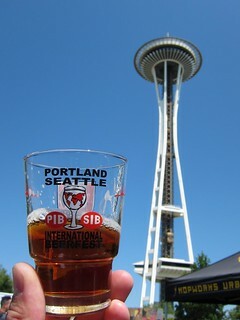 The Seattle International Beer Festival (SIB) will take place at the Seattle Center Fisher Lawn & Pavilion this Friday, July 5, through Sunday, July 7. While most beer festivals focus on local beers, SIB brings in some great beers from all over the world. They will have over 200 beers from 16 countries, both on draft and poured from bottles. There are always quite a few gems at this fest, and this year is no exception. You can check out the full list of beers here, and I’ll be putting up a target list later in the week. Be careful; many of these beers are high alcohol and will catch up to you. I highly suggest taking public transportation, which shouldn’t be an issue due to its central location. Tickets are $25 online, or $30 at the gate (cash only) and include 10 beer tickets and a SIB glass. Or, you can get the “Big Deal” online, which for $45 includes 40 beer tickets total. You can revisit all weekend without an additional entry cost. Beers will “cost” you between 1 and 7 tickets, depending on how expensive the particular beer was for the organizers to procure. There will be many bottled beers available that cost upwards of $20 or even $30 per bottle, and SIB is a great chance to try those without throwing down $ for a whole bottle. There are always plenty of interesting beers available for 1 ticket, so you can stick to those if you prefer. Cross your fingers, but the weather is currently projected to be perfect next weekend with nothing but sun and temps in the high 70s, low 80s. You can find out more about SIB at their website.